The best power amplifier you've never heard of? Before getting down to the business of this review, a brief personal note. Over the last couple of years health issues have made me mostly inactive on Enjoy the Music.com. I thank Steven R. Rochlin for his encouragement; and my fellow classical music writers for carrying the load during those difficult times. Nothing is better for restarting a writer than having an inspiring topic and the Innamorata amplifier has been just that inspirational topic for me. A little historical background: Jeff Wells has for years been the owner of the Campbell, California retail store Audible Arts, and during my residence in the San Francisco Bay area we did a lot of critical listening together. After my move to Chicago in 2005 we’ve stayed in touch. In 2011 Jeff started telling me about the new amplifier he was developing, which he regarded as the overall best-sounding power amp he had ever worked with. Even making allowances for proprietary enthusiasm, I felt that this must be an amplifier worth investigating. After all, years ago it had been Jeff's enthusiasm for the Greek-made Analysis planar-ribbon loudspeakers that led me into my continuing love affair with the Analysis Amphitryons, which will likely be my speakers. Another reason to take the Innamorata seriously is the involvement of Scott Frankland. Over many years Scott has been a talented and meticulous designer/engineer. Famous for designs such as the tubed Wavestream Kinetics power amplifiers Scott now wears numerous hats. He still designs proprietary preamplifiers and amplifiers, and is President and Chief Technical Officer of Bybee Labs, whose Music Rails are key to the sound of the Innamorata. Last summer Jeff shipped me his demo Innamorata and came for a visit with me and a prospective Chicago retailer. I had four days to listen, and after that I ordered my own Innamorata and started planning this review. But health issues intervened, and only now, months later, can I finally tell you about this amazing amplifier. 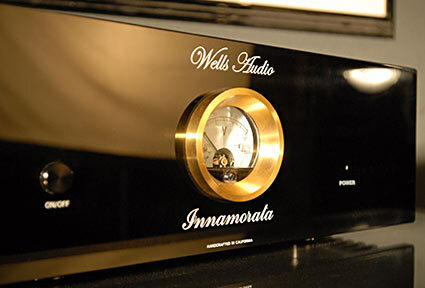 The Innamorata is a solid-state amplifier rated conservatively at a continuous 120 wpc into 8 Ohms, 200 into 4 Ohms. It is about the size and weight one would expect, but there are a few departures from the norm of medium-power amplifiers. Connections are simple: one pair of RCA input jacks, no XLR jacks, and a single pair of WBT five-way speaker terminals. The dark Plexiglas front panel sports a power switch, a center voltage meter, and the product name in white script. Heat sinks run down both sides, and sturdy feet support the amplifier. I have taken an expert "guided tour" of the uncommonly neat and clean interior of the Innamorata, and high-quality transistors, resistors, capacitors and switches are evident throughout. But I'm not going to list brand names, because this lavish use of excellent parts does not meaningfully account for the sonic at uniqueness of the Innamorata. Yes, wiring paths are short. Critical circuit areas are well protected. It’s easy to see the work of a gifted engineer in the layout. The special qualities of this amplifier begin with those basic virtues and accumulate through decisions which some may regard as "tweaks," but to my mind are factors that, though widely known, are unfortunately not widely practiced by audio manufacturers. Let's take a look at those factors. Proprietary Wiring & Transformers: Rather than use off-the-shelf transformers, Scott and Jeff specified precise performance parameters for the Innamorata. Moreover, special proprietary wire, audibly superior to available copper and silver hookup wire. Is used everywhere. Bybee Quantum Purification: The Innamorata features Jack Bybee's latest and most powerful 'Super Effect' AC Bullets. Uniquely in my experience, these Bybee devices attack 1/F noise, a form of quantum mechanical noise created by the flow of electrons through conductors. Though it is inaudible to the human ear as an isolated phenomenon, eliminating 1/F noise allows program material to emerge with greater naturalness and beauty, yielding a more musical and less ‘electronic’ sound. I am a Bybee enthusiast whose system includes many internally installed Bybee devices as well as plug-in Bybee accessories. These devices are a major reason for the wonderful musicality of the Innamorata. Bybee Music Rails: The Innamorata is the first production amplifier to incorporate the Music Rails. Unlike the passive Bybee devices described above, the Music Rail is an active electronic noise-filtering circuit that can reduce the noise floor of the amplifier by up to 45dB! I have had a great deal of experience with the Music Rails, having had them installed in another preamplifier, which then became the quietest preamplifier I had ever experienced. The Innamorata is easily the quietest amplifier this writer has encounters. That is all the more amazing because my apartment in a Chicago Loop high-rise has been dubbed "RFI Ground Zero." I have spent years working eliminate the abundant RFI streaming into my listening room, and now I don't hear it at all! For this review I put the Innamorata into my reference system in place of the Spectron Musician III SE Mk. 2 amplifiers, which were configured as bridged monoblocks with "full boat" V-Cap and Bybee SE AC Bullet upgrades. Since the bridged Spectrons can deliver 2000+ WPC into my medium-sensitivity (86dB/W/m) speakers, the first issue was whether the Innamorata would be able to drive this highly demanding system to satisfying volume levels. I was skeptical at first, but as the review went on I recognized that music playing through the Innamorata is so completely satisfying that I no longer need to crank the volume up to the often unwise levels I had gotten used to. No, the system cannot reach the thunderous volume levels that the Spectrons attained so effortlessly, but the listening experience as a whole has become more completely engaging. My left-brain analytical side especially appreciates the extraordinary improvement in low-level detail that the Innamorata’s unprecedentedly low noise floor makes audible; the uncannily precise lateral and front-to-back placement of individual instruments or voices; and the low-frequency pitch definition, which is now even greater than the previous high standard set by the Spectrons. My pleasure-seeking right brain revels in the sheer tonal beauty that the Innamorata exposes in every musical genre. After listening to the Innamorata for an hour or so, a friend commented that the Innamorata "sounds like the best tube amp I ever heard, except that it has better bass than any other amplifier I've heard." That's about as succinct yet accurate a summation as I could come up with. The Innamorata has none of the over-damped harmonic sterility I hear in so many me-too solid-state amplifiers. Its presentation is warm and emotionally engaging, drawing me in for hours with no listening fatigue, regardless of the kind of music playing. For example, the spacious big-hall acoustic of Valery Gergiev leading the London Symphony Orchestra on the LSO Live label is captured to perfection. We hear the extended reverberation of London's Barbicon Centre while still catching every nuance of this superb performance. In fact, the ability to capture very different acoustical settings is a real strength of this amplifier. Just compare the close-up, almost in-your-face presentation of John Adams' Harmonielehre (Michael Tilson Thomas conducting the San Francisco Symphony on SFS Media) to the more distant mid-to-rear-hall perspective of Mahler's First Symphony with Ivan Fischer and the Budapest Festival Orchestra on Channel Classics. These two marvelous performances could hardly be recorded more differently, yet each delivers a compelling listening experience. The same is true for chamber and solo performances. For Jon Manasse and the Tokyo Quartet playing the Brahms Clarinet Quintet, we hear a smaller but still generous acoustic space with the players' positions clearly identifiable. The "woodiness" of the clarinet is a special pleasure here – I don't think I've ever heard it sound quite so lovely. Piano reproduction – one of the very hardest things for an audio system to get right – has reached a new level of realism with the Innamorata in place. I could cite dozens of recordings, but give a listen to Paul Lewis playing Schubert Impromptus, or Stephen Hough doing Chopin Waltzes. Within the limits of your system, I'll wager you'll hear a piano sound that is more precisely colorful with the Innamorata than with whatever amplifier you are comparing it to. It is of course no surprise that the Innamorata excels in reproducing vocals. Whether it's the great Anna Netrebko singing Bellini, Patricia Barber singing Cole Porter or Allison Krauss singing bluegrass, I have spent many nights listening way past bedtime. To a degree that I never experienced in decades of listening to recorded music, the Innamorata seems to make the system just get out of the way. In a new (for me) way, listening to music has become more intimate and satisfying in the home than ever before. There is still no substitute for live music, and I treasure my 60+ live concerts every year – but I look forward to an evening in front of my speakers with almost as much anticipation as a live concert with the great Chicago Symphony Orchestra! There isn't a lot of surprise with my conclusions. Yes, I have purchased the Innamorata. Looking ahead, I don't expect to find its equal any time soon. Sometime in the coming year, if finances permit, I'd like to acquire a second Innamorata in order to passively bi-amp the system. If that happens, I will be able to eliminate the rare instance where I'd like to crank the music up a bit louder than usual, but am limited by the amplifier's power. Since two identical Innamoratas could bi-amp my two-way Analysis Amphitryons with no need for an electronic crossover, the only additional expense would be the amplifier and cables. If it happens, I'll offer a brief follow-up to this review. For Jeff Wells the Innamorata is opening the possibility of a new distributorship. The Innamorata is complemented by the $4000 Wells Audio Akasha, which is identical to the Innamorata except for omitting the Bybee AC Bullets and Music Rails. Jeff has other components and cables, and he is also planning a companion tubed line stage for later this year. I have recently been listening to a Wells-modified Jovita Fusion line stage, with the same Bybee upgrades as the Innamorata and fabulous NOS tubes, and it is more than competitive with other megabuck preamps. So I have high hopes for the coming Wells Audio preamplifier and other products that are now just a gleam in his eye.